No. 16, Jalan Belati 1, Off Jalan Kempas Lama, Taman Perindustrian Maju Jaya, 81300 Skudai, Johor Bahru, Malaysia. 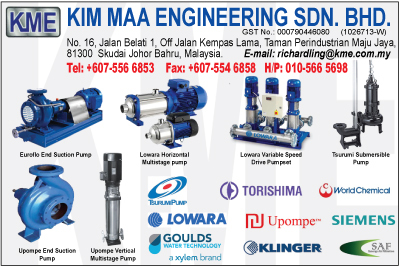 KIM MAA ENGINEERING SDN BHD established to serve its'customers'diverse needs by offering superior quality products, competitive prices and unsurpassed service support. Our comprehensive range of products is ensuring you innovative solutions to meet our world’s water needs. Our AIM to be your preferred partner in water technologies.